Amtrak train crashes in Philadelphia. 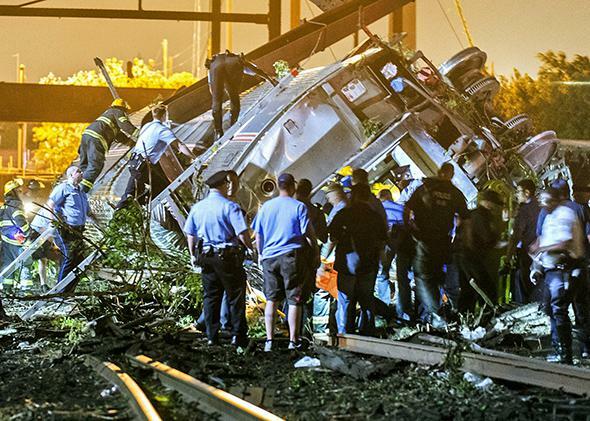 Rescue workers climb into the wreckage of the crashed Amtrak train in Philadelphia. Update, 2:55 p.m.: The AP, based on a surveillance video, estimates the train was traveling 107 mph before it crashed. 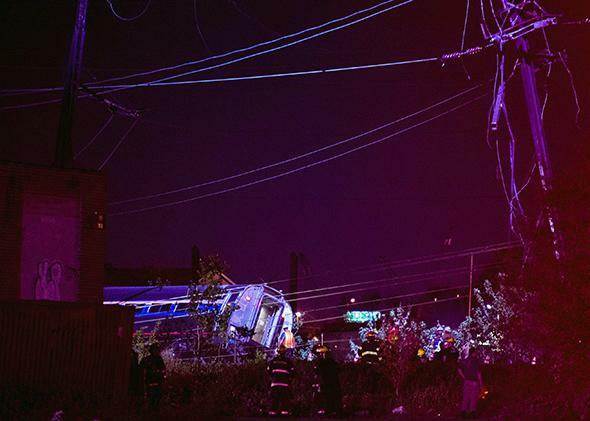 The New York Times reports that data from the train’s “black box” data recorder also indicates that the train’s speed was above 100 mph at the time. Update, 12:55 p.m.: Mutiple reports indicate that a seventh victim of Tuesday’s crash has been confirmed to have died. The Wall Street Journal, meanwhile, reports that the train that derailed was traveling more than 100 miles per hour when it entered a curved section of track whose speed limit is 50 mph. “Amtrak officials notified some employees on a Wednesday conference call that excessive speed was believed to have contributed to the crash,” the paper says. Update, 12:30 p.m.: Investigators have recovered the derailed train’s “black box” data recorder, which includes “information like the train’s speed, images from a video camera on the engine and a log of when the train’s operator used tools like the brake, throttle and horn,” officials say. The train’s engineer was injured but has spoken to police. Not all passengers have yet been accounted for, Philadelphia mayor Michael Nutter says, and there may be more individuals who have died who have not yet been found in the train’s wreckage. Update, 9:05 a.m.: A CNN correspondent has posted footage of the crash from a surveillance video. Update, 7:50 a.m.: The number of confirmed fatalities in the Amtrak derailment is six, with a reported eight other individuals in critical condition. At a 1 a.m. press conference, Philadelphia Mayor Michael Nutter and Pennsylvania Gov. Tom Wolf said at least 65 people total had been hospitalized after the crash. ABC News reported last Friday that the FBI had sent a bulletin to law enforcement agencies about nine pieces of train-derailing equipment that had been reported stolen recently, but the FBI has so far said that there is no indication of terrorism in the crash. Rescue workers at the scene. Original post, 1:00 a.m.: An Amtrak train traveling from Washington, D.C. to New York City derailed and crashed in Philadelphia on Tuesday evening reportedly around 9:30 p.m. Philadelphia mayor Michael Nutter confirmed at least five fatalities in a press conference late Tuesday night. Officials told NBC 10 earlier in the evening at least 50 people were injured during the crash; 243 people were on board Train 188. Some of the cars appear to have flipped over as rescue workers treated injured passengers on the scene. The cause of the derailment is not yet known. Amtrak has shut down train service between Philadelphia and New York City for the night, according to CNN. The FBI says there is no indication the crash was an intentional act of terrorism, CNN reports. The National Transportation Safety Board is sending a team to investigate the crash site Wednesday morning. I was traveling south this evening on Amtrak train 2173 just prior to arriving in Philadelphia when I heard a loud thump. A passenger a couple rows ahead of me pointed to his window at a large crack that just appeared. When we arrived in Philadelphia, a few Amtrak workers examined the window. The conductor was the first—alerted to the crack by other passengers, I believe. He suggested that the passenger sitting by the window move to another seat. The conductor soon returned with a man who appeared to be a maintenance worker. 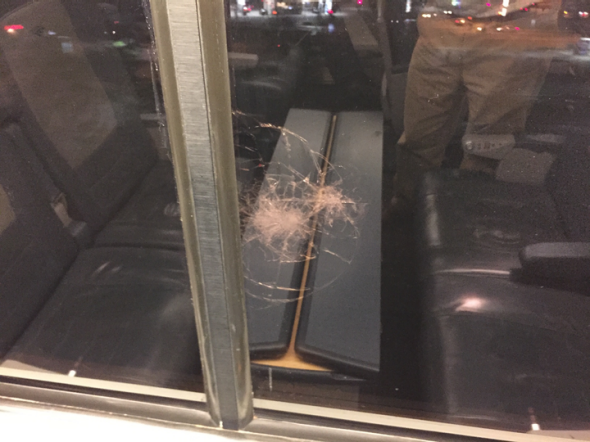 He examined the glass and noted that the impact didn’t break “the second layer.” They left and the conductor returned a third time with two uniformed Amtrak police officers. They looked at the window, took photos, and left. I learned of the derailment of Amtrak 188 about 30 minutes later. According to Amtrak’s status system, my train arrived in Philadelphia at 9:14 p.m. and departed at 9:26 p.m. The impact on the window happened approximately five minutes before we arrived. Amtrak 188 derailed only a few minutes later, at approximately 9:30 p.m. Train window on southbound Amtrak train. Former Pennsylvania congressman Patrick Murphy was on the train at the time of the crash. “It wobbled at first and then went off the tracks. There were some pretty banged-up people. One guy next to me was passed out. We kicked out the window in the top of the train car and helped get everyone out,” he told NBC News. *This is a developing story; check back for updates.